California's senior senator urged state racing authorities to shut down events just five days before the prestigious Santa Anita Derby. LOS ANGELES — Sen. Dianne Feinstein called for all racing to be suspended at Santa Anita Park on Tuesday after a 23rd horse was fatally injured since Christmas at the track, one of the most prestigious venues in the sport. "The death of a single horse is a tragedy, but as a lifelong lover of horses, I'm appalled that almost two dozen horses have died in just four months," the California Democrat said in a letter to Chuck Winner, chairman of the California Horse Racing Board. The letter was sent five days before the park in Arcadia, about 20 miles northeast of Los Angeles, is scheduled to host the $1 million Santa Anita Derby, one of the sport's premier events. Twenty-one horses suffered injuries that required them to be euthanized from Dec. 26 until March 5, when racing was suspended as track officials tried to figure out what was going wrong. A 22nd horse was put down following a training accident March 14, prompting the track's owners, the Stronach Group, to ban the use of drugs on race days and to sharply limit jockeys' use of whips. 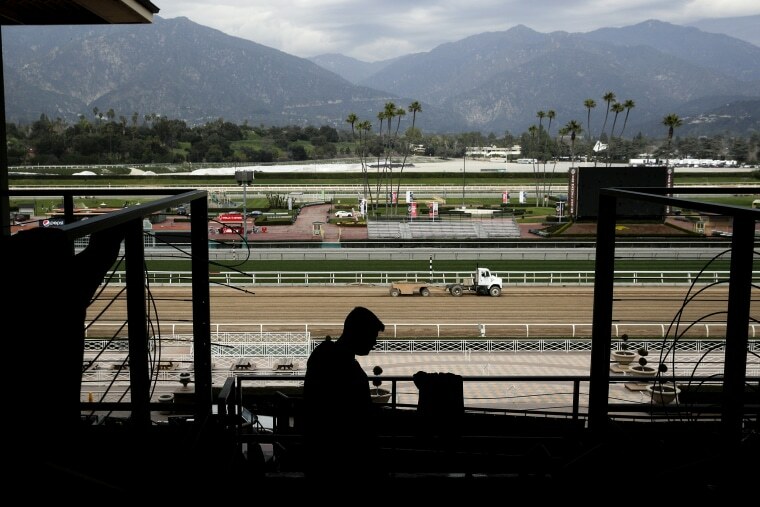 The state horse racing board last week approved extending most the reforms instituted at Santa Anita to all of California's tracks, which still faces regulatory approval. Racing resumed after almost a month on Friday, and just two days later, Arms Runner, a 5-year-old gelding, collided with another horse at a dirt crossing during the San Simeon Stakes and suffered fatal injuries. In her letter Tuesday, Feinstein called the moves already made at Santa Anita "positive initial steps," but she called on the track to shut down racing "until the cause or causes of these deaths can be fully investigated." And she called on the state board to consider going further by banning more medications and the use of synthetic track surfaces. Separately, the animal rights group People for the Ethical Treatment of Animals, or PETA, on Monday called on the board to enact emergency rules to ban the use of all drugs and at California tracks. "Anything short of this is inadequate," Kathy Guillermo, PETA's senior vice president for investigative and legal cases, said in a statement. Santa Anita Park called the euthanization of Arms Runner "a gut-wrenching blow," saying it "speaks to the larger issue of doing all that we can to better understand and prevent such catastrophic injuries, not only at Santa Anita, but throughout California and across the country." A full slate of racing was scheduled to continue Thursday.